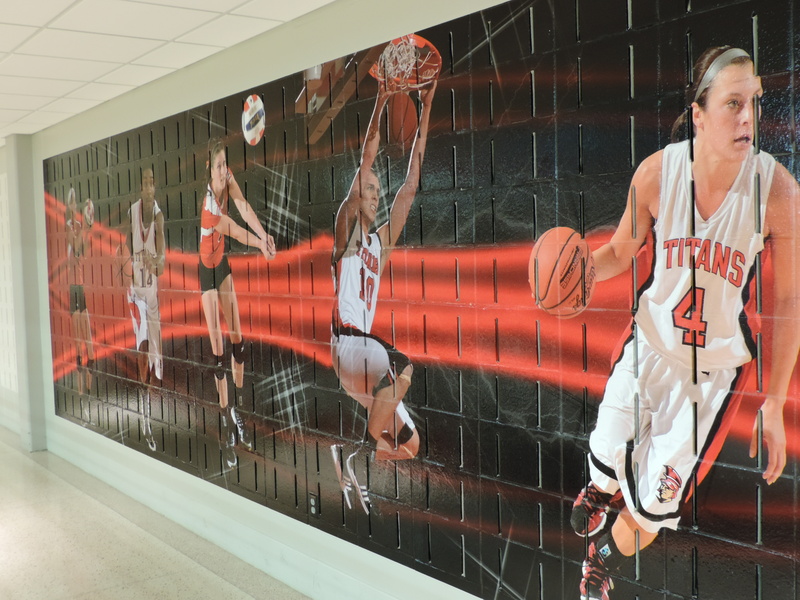 A mural in the SAC may be added to in order to include three new sports. A new rule is forcing IU South Bend’s athletic program to expand from three to at least six teams. The new rule, put into place by the National Association of Intercollegiate Athletics (NAIA), requires any college that participates in varsity sports to have at least six varsity sports. If a college fails to adhere to the rule, or simply can’t expand to six teams, then that college’s teams can’t compete in any post-season. IUSB Chancellor Terry Allison said that the funding for the three new teams would be reallocated from current sources, but would also come from fundraising, sponsorships and underwriting from local businesses and people. Allison said there are many in the community who would like to see the IUSB campus thrive and its students succeed. According to Allison one of the major advantages to being able to remain in the NAIA is the ability to compete with quality opponents, while maintaining the school’s credibility, and remaining in a conference that helps with recruiting and drawing attendance for games. Executive Director of Athletics and Activities Gary Demski agrees that expanding the athletic program is a positive thing. Demski said that student athletes at IUSB have a stronger retention rate than average students. He cited the rate as being close to 90 percent. The adding of the new teams hinges on a proposal that has been submitted to and approved by the senate athletic committee and is currently waiting approval by the faculty senate, according to Demski. He said the school is currently moving forward with their expansion plan. Under the current proposal the school would add both men’s and women’s cross country and a men’s golf squad by the fall of 2015. As college athletics rely so heavily on recruiting, Demski said that the most important step for the school is to get coaches in place as soon as possible in order to give the new skippers at least a year to draw new student athletes into IUSB. Demski would like to have the new coaches in place by July 1 of this year.